Few days ago when I was reaching for my favorite stainless steel frying pan I spotted my French made 20cm black steel crêpe pans. I bought them while attending George Brown College (Chef School) back in 1978-79 and they are perfectly seasoned. I did use them a lot back in Toronto but haven’t touch them since moving here. Out came my school recipe for crêpes and it was just like if I made them on weekly basis. Again, the recipe has to be adjusted by pretty much everybody because every bag of flour has different moisture content and even milk differs. 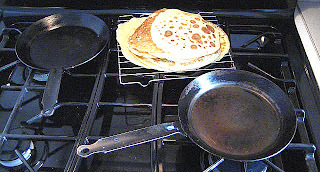 On top of it to tell you how long to cook the first and second side of crêpe batter is impossible because every frying or crêpe pan is different and so are the burners. Beat eggs, milk and salt until smooth. Add 2 cups of milk and beat, again until smooth. 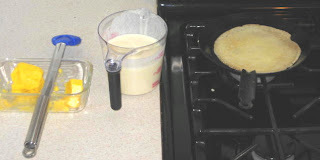 Test if the batter is light. It should have a little thicker consistency then 35% cream. 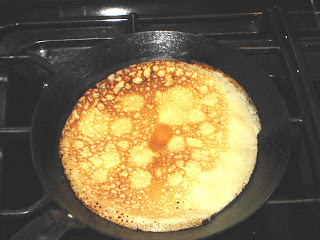 Adjust accordingly (too thick, add milk; too thin, add flour). 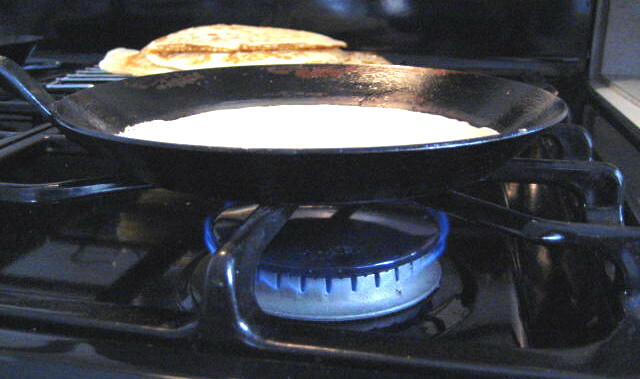 The crêpe pan should be hot but not too hot. 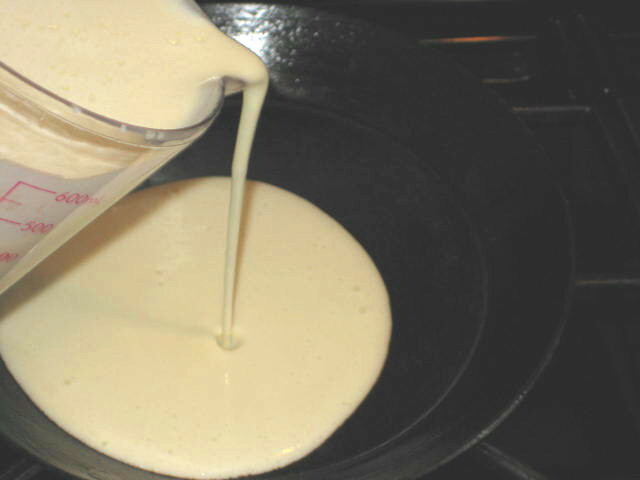 When you pour in batter it should just set but not bubble right away. My set up is ready: butter with brush and batter in a 30 ounce measuring cup. 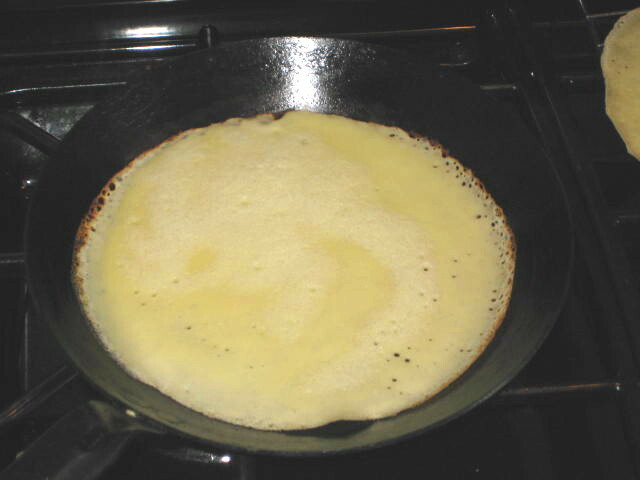 Perfect (for me) crêpe pan temperature is 280°F and 290°F. 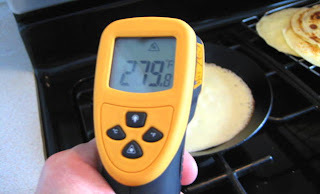 I love my infrared thermometer. This is largest burner on my stove at very low. Perfect setting. Time to turn over: edges are free and small pinholes in center have formed. My crêpes are ready for all sorts of fillings like seafood (clams, pink salmon and shrimps) in Mornay (cheese) sauce. That will be next post.